Home » AEON » car » MPH » Parkson » purchase » qna » spend » vouchers » Aug15-Dec31: MPH 110th Anniversary "Spend & Win" Contest: Read, Count, Sweep and win a Proton Suprima S! 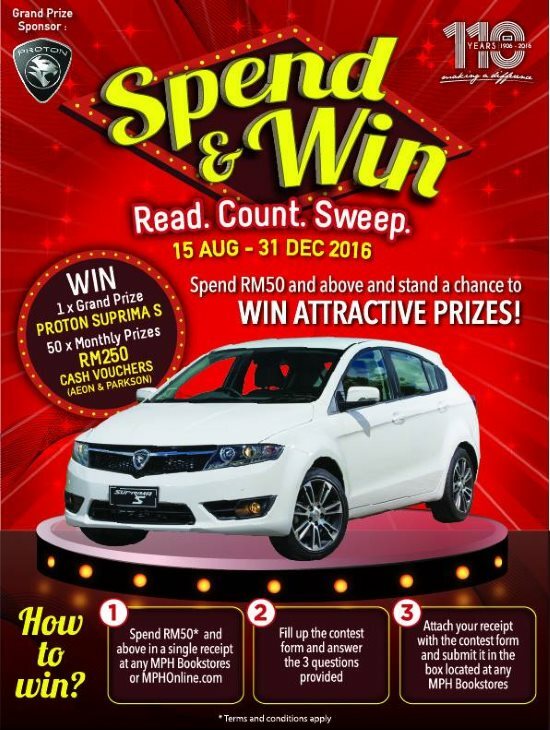 Aug15-Dec31: MPH 110th Anniversary "Spend & Win" Contest: Read, Count, Sweep and win a Proton Suprima S! Spend RM50 and above in a single receipt at any MPH Bookstores or MPHOnline.com. Fill up the contest form and answer the 3 questions provided. Attach your receipt with the contest form and submit it in the box located at any MPH Bookstores. Winners will be announced on MPH CLICK Facebook page and MPH Click Blog every month. Visit MPH Spend & Win contest page for more details.